Biographical Information: Joseph Christopher Douglas was born on 29th December 1889, and baptised at the Sacred Heart RC Church, St. Helens, Lancashire, on January 18th1890. Joseph was brought up in St Helens by his father, John, a coal dealer, and his mother, Jessie Mary. He had seven siblings. He joined the Stoker branch of the Royal Navy, and by 1911 was serving in Devonport-based cruiser HMS Aboukir in the Mediterranean. He served in the Royal Navy throughout the First World War. Joseph was in Hood’s ship’s company during the Empire Cruise of 1923-4, and his photo, taken in San Francisco, dates from that time. It shows him as a Leading Stoker wearing “square rig”, with his Hood cap tally clearly visible, and three “good conduct” badges on his left arm. A little over a year later, in 1925, whilst still in Hood, he was advanced to the rate of Stoker Petty Officer. Family memory recalls Joseph and says he never married. 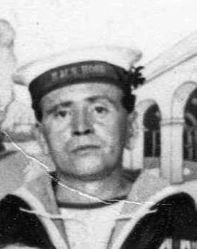 He left the Royal Navy in 1929 and died in his home town of St. Helens on 9th August 1937, of congestive heart failure.